We move pool tables for installation of new flooring. All pool table moving services include our exclusive lifetime warranty. Our company is licensed and insured to protect your investment. Our pool table moving service uses a covered trailer while servicing the entire metro Atlanta area. No stair charges, all makes and models of pool tables. We will service pool tables outside of the cities listed above. A mileage fee will apply. We service all brands of pool tables. 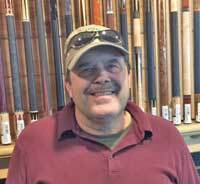 Kasson, Gandy, Peter Vitalie, Olhausen, Atlantic Billiards, Liesure Bay, A.E. Schmidt, American Heritage, Legacy Billiards, AMF, Brunswick, Connelly, Presidential, World of Liesure, Spencer Marston, Craftmaster, and the list goes on and on. Moving a pool table to install new flooring is a 2 trip process. To avoid damage to your pool table, we completely disassemble your pool table before moving it. Complete disassembly of your pool table. Placement of pool table in storage area. How long does it take for us to disassemble your pool table for storage? 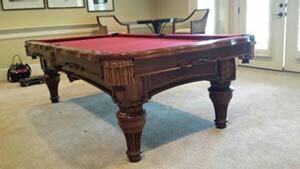 On average it takes us 30 to 45 minutes to inspect and disassemble your pool table for storage. How long does it take for us to reassemble your pool table? On average it takes us 1.5 to 2 hours to inspect and reinstall your pool table. This does not have to be done everytime your pool table is reinstalled. Felt is reuseable up to 3 times provided the felt is not in excess of 7 to 10 years old. There are somethings that you may want to consider ahead of time to make the installation go smoother. Before we install your pool table, you want to consider the color, condition and age of your felt. More often than not, the color scheme in the new room differs from the old home. If the felt on the pool table is older than 7 years, now is a good time to have it refelted. As felt ages, it gets weak and may tear when we try to restretch it. If we plan for refelting while installing the table, we offer discounts on our refelt service. See our felt color chart for color ideas. If you have a pool table light, you want to have that installed prior to us installing the pool table. It is much easier to install a light before the pool table gets there as you cannot stand on the pool table once it is leveled and ready for play. If you have a rug and are not sure of the exact location your pool table will be located, we will help you with the placement of the rug. Ideally you want a pool table light to be 36 to 40 inches above the play surface. If your light is the properly sized for the size of pool table you have, this should light the table evenly from end to end and side to side. To do this correctly without the pool table in place, the first thing we need to know is the height of the pool table. Most pool tables measure 30 inches from teh floor to the top of the slate. Giving the proper measurement as 66 to 70 inches from teh floor to the bottom of the light's shades. You want the light centered over the eventual location of the pool table. A pool table can be set up on any type of floor. Hardwood, tile, vinyl or carpet. If you are installing a pool table in a room without carpet, we do recommend an area rug. This will help to stablize the pool table and might aid in hiding any shims that might otherwise show under the legs.